Perhaps it is due to the weather being sunny and then quickly returning to a wintery grey with freezing temperatures that put me in a stew frame of mind. 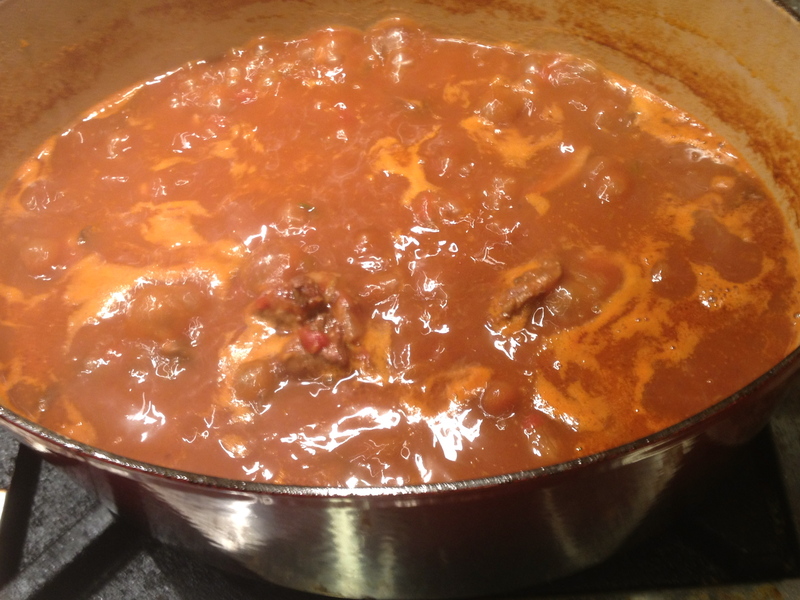 Or, perhaps it is simply that I love a sticky and unctuous lamb stew on any night of the week, regardless of the weather. Either way, this stew makes me feel all warm and fuzzy inside with the added benefit of leaving enough leftovers so that both the hubby and I can eat it for lunch the next day and freeze another serving for the emergency stew craving. 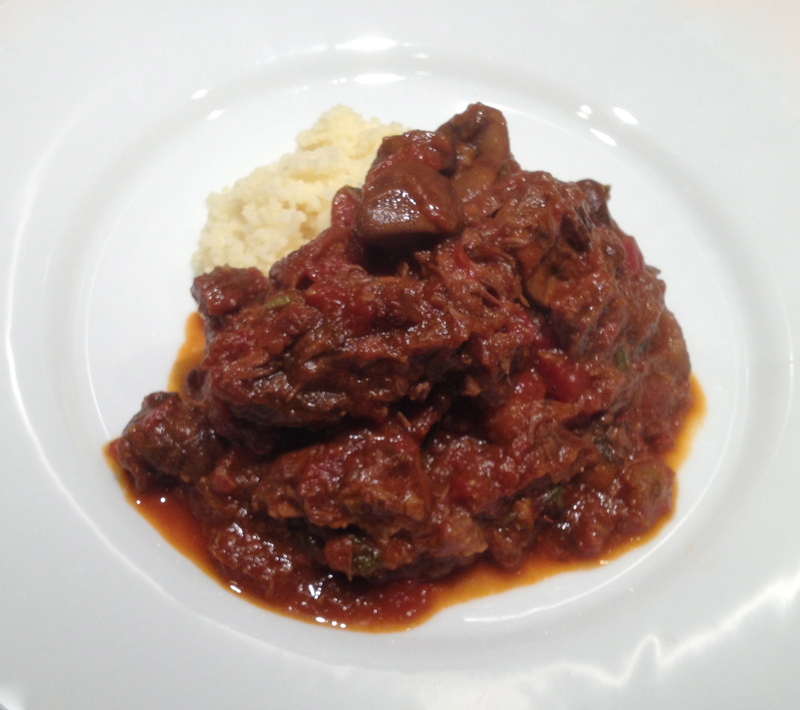 This stew takes it’s inspiration from my Moorish ancestors, adding dried apricots, cumin and tomatoes; then serving it over cous cous. The apricot is the real surprise in this dish. I use an unsweetened and unsulfered variety. 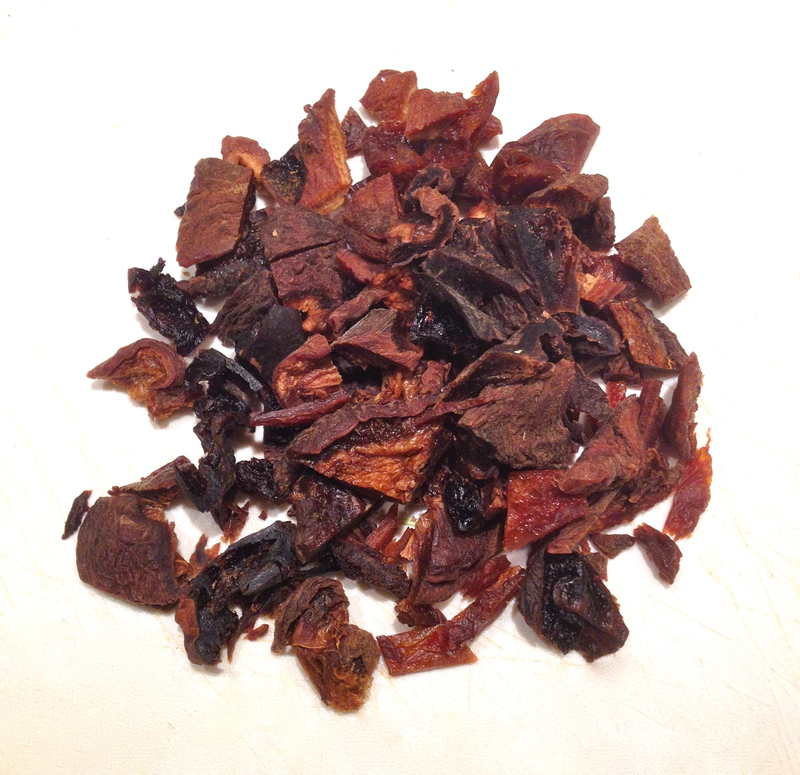 This lends a richness to the dish rather than the cloying sweetness you get with the sweetened and sulfered apricots. I really love serving this dish with Cous Cous not only because it soaks up all the lovely sauce but because it cooks so quickly and let me be honest, after cooking a stew for hours, I want something fast to serve it with. Roughly chop the Carrot, finely slice the celery, dice the onion, crush the garlic, stem and break up the mushrooms and season the lamb with salt and pepper. Set to one side. 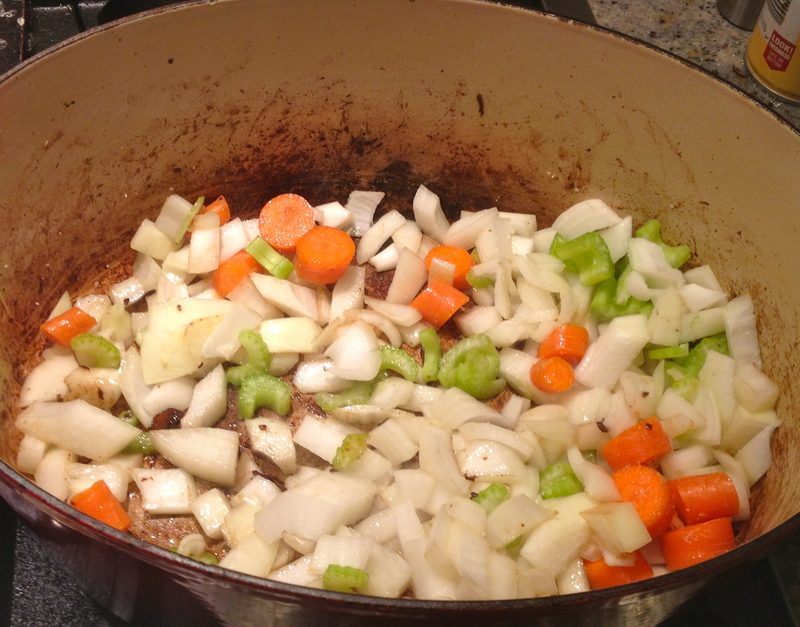 Place a large Dutch oven or stock pot over high heat and allow to get nice and hot. 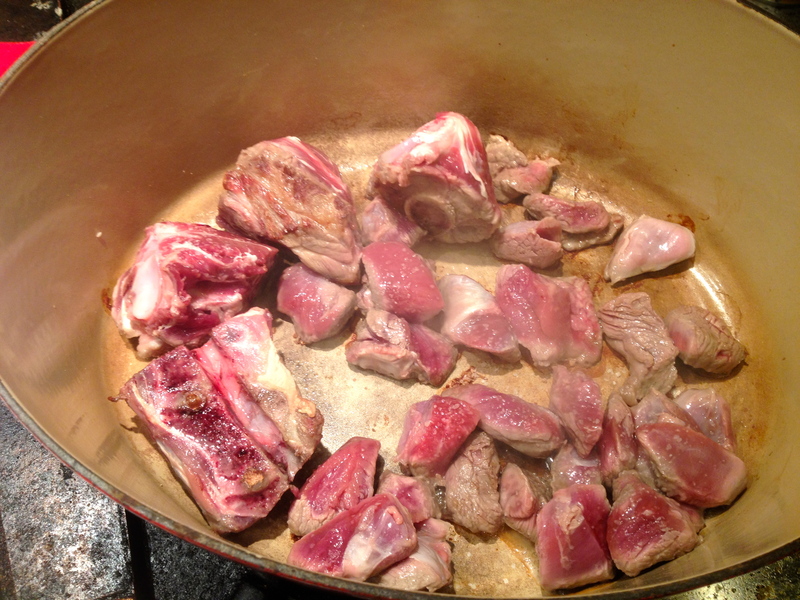 Add the lamb pieces, both bone and shoulder, to the dry pan. 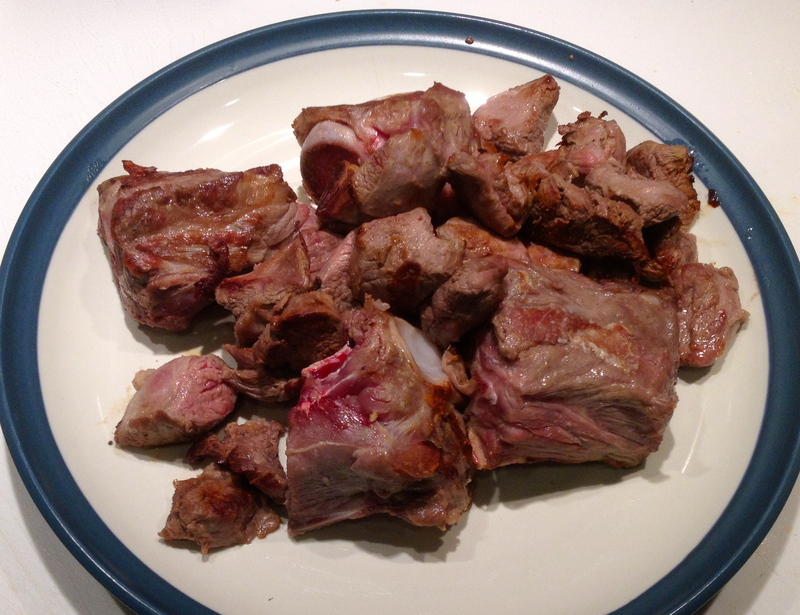 There is no need for oil here as the lamb is fatty enough. The trick here is to let the lamb be for a minute or two before you turn it. If the pot was hot enough it will not stick, and if it does stick a bit, it doesn’t matter, you will be scraping it off the bottom of the pan anyway. Turn it around so that it is brown on all sides and then remove to a plate. The idea here is simply to brown, not to cook through. 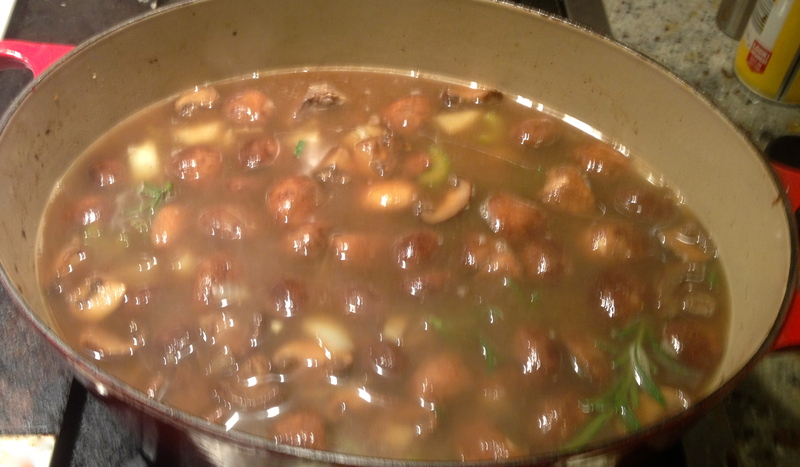 Next add the mushrooms to the pot. Saute until they have given up most of their liquid. 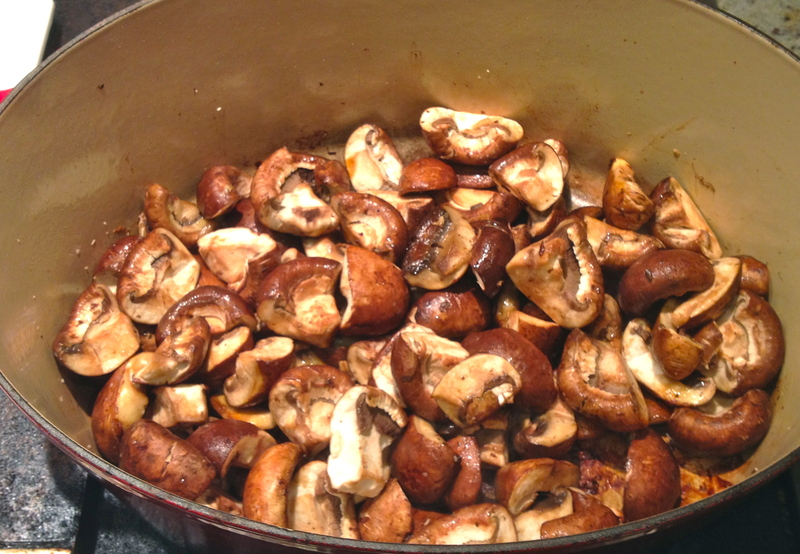 If they get too dry you may add a teaspoon of extra virgin olive oil. 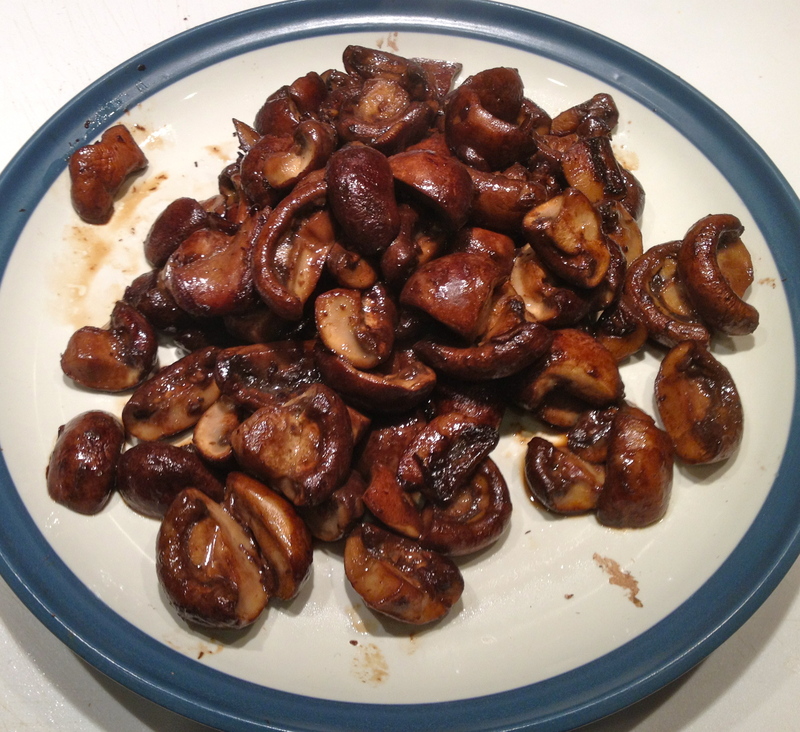 Do not add salt to the mushrooms at this point as that will draw out the liquid in the mushrooms and they won’t fry up, instead simmering in their own juices which defeats the purpose of cooking them separately. 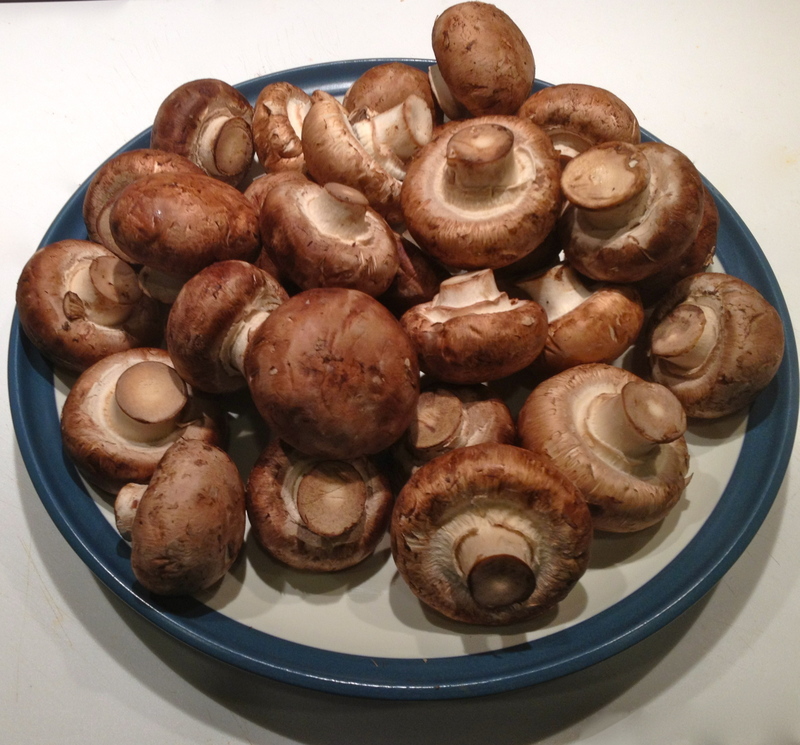 Once they have browned and are fairly cooked through, remove them to a plate. 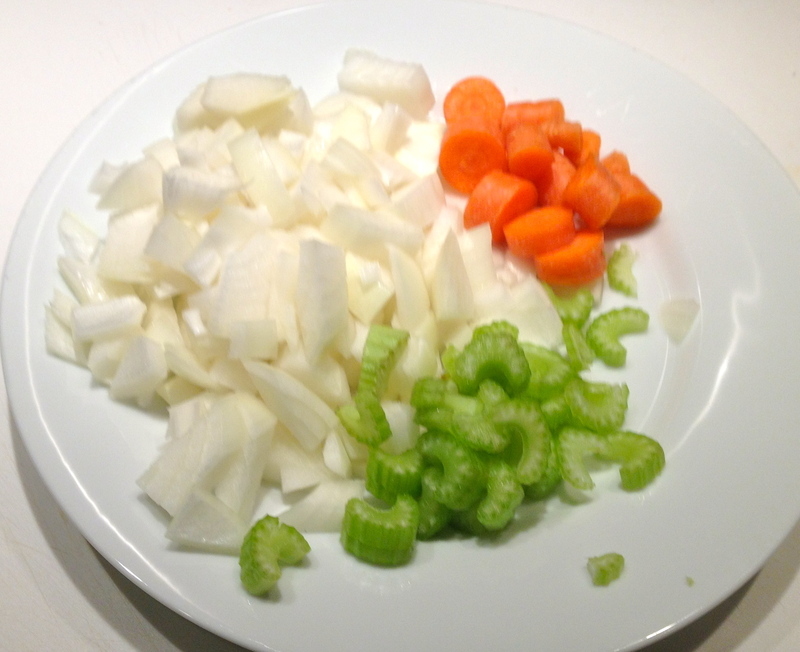 Now, add the onions, celery and carrots to the pot and reduce heat to medium. Season with salt and pepper to help the onions release their liquid and begin to sweat. After 3-5 minutes the onions should be soft and translucent. 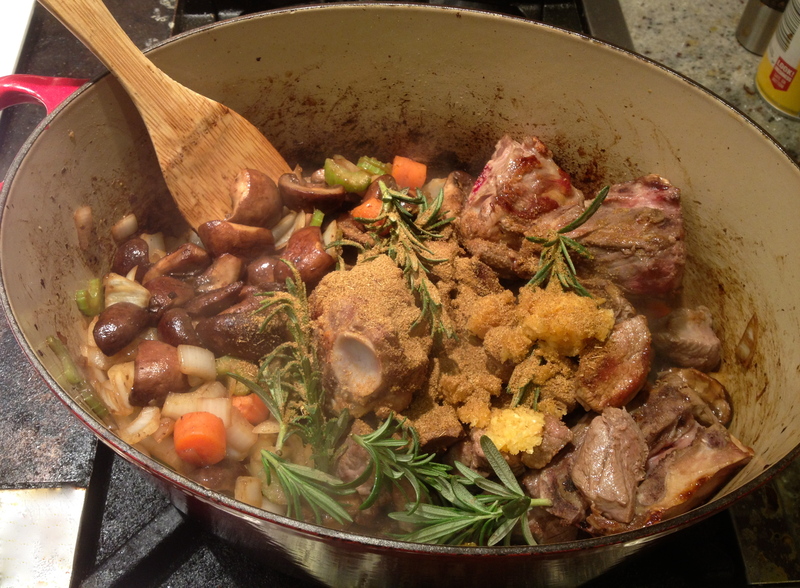 Add the lamb and mushrooms back into the pot along with the cumin, garlic and rosemary. Stir together and then add the tomatoes and water. Bring to a simmer and allow to cook for roughly 1 1/2 hours. Add the apricots and allow to simmer for another 30-40 minutes or until the meat is falling off the bones and the shoulder meat is super tender. 1.5 hours of cooking done, time for the Apricots! Serve over cous cous and apply to face. This looks awesome! 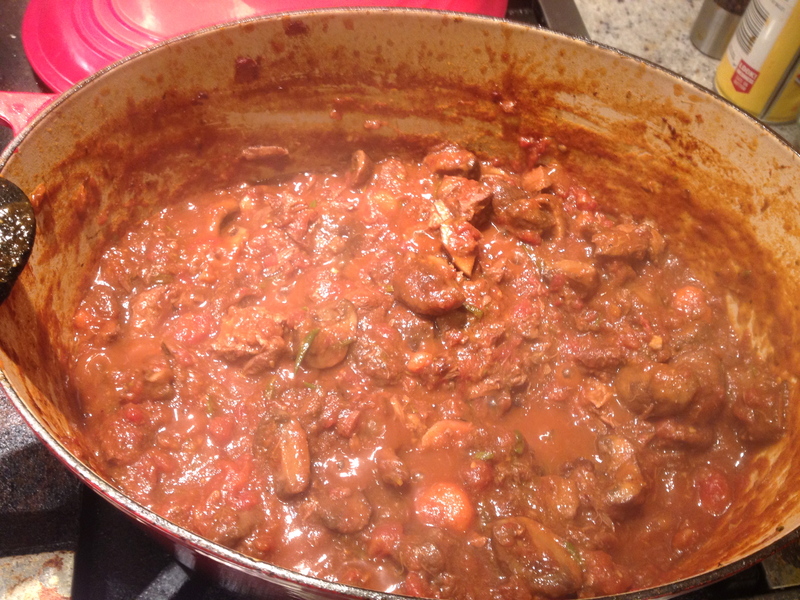 I recently made a lamb stew with prunes in it, so I can see how the apricots would add some really great flavor. It looks really, really tasty! Thank you! Dates sound really good too… might have to give that a try next time.